A rare first day cover autographed by Barnes Wallis has gone on sale on eBay. It has been donated to the 617 Squadron Netherlands Aircrew Memorial Foundation, and the proceeds from the sale will be given to the appeal fund for a new memorial to the crew of Dams Raid aircraft AJ-A, piloted by Sqn Ldr Melvin (Dinghy) Young, which shot down at Castricum-aan-Zee on the Dutch coast on 17 May 1943. The memorial will be unveiled in 2018 to mark the 75th anniversary of the crew’s burial in the nearby Bergen cemetery. The item was generously donated to the Fund by the collector Ray Hepner. The cover was signed by Sir Barnes Wallis in June 1976 at his residence, White Hill House, Effingham, Surrey, and given to Ray Hepner. It is one of the First Day Covers produced to commemorate the 40th anniversary of the first flight of the Vickers Wellington bomber, designed by Wallis. Further details can be found on the eBay site here. The sale will close on 30 November 2017. Short notice, I know, but if you are in the Watford area tomorrow (Saturday 9 September) you might like to visit this important site. This is the model dam which was built in the grounds of the Building Research Establishment (BRE) in Garston, near Watford. The construction took place with great secrecy in the winter of 1940–41, two years before the Dams Raid actually took place. On their own initiative, BRE scientists and their colleagues at the Road Research Laboratory (RRL) in Harmondsworth had been discussing possible ways of attacking the German dams before the involvement of Barnes Wallis. The model, which survives today at the centre of the now enlarged BRE site, was built in seven weeks between November 1940 and January 1941. Temperature records from the time show that the winter was very cold, with daytime temperatures close to or below freezing over much of this period, and photographs show snow on the ground. To conceal its identity, the model was referred to as ‘Weir No. 1.’ in the records. These show that work at the site started on Monday 25 November 1940, when the area was excavated to widen and deepen the stream, and to prepare an area for the concrete base of the dam. The foundation concrete was poured on 29 November, and the two towers of the dam were cast in situ the following Monday. The side wings [were] completed shortly after this. To allow the model to be built across the stream, a pipe was placed in the foundation to carry the water beneath the centre section during its construction. To get a flavour of what is also viewable at Garston, read this account of last year’s open day by Diamond Geezer. Hat tip to him for the post alerting me to this event, and also for use of the photograph above. Four graphic design students from Northumbria University have been working on an exhibition project about Barnes Wallis as part of their degree course. I am sure that readers will agree with me that the images they have produced are very interesting and effective, and would grace the walls of any gallery if one could be found to take it on. You can see the full exhibition here. The students are Patrick Pyka, Ashley Sowerby, Shaun Okoh and Megan Anderson. The name of Barnes Wallis is of course well known to students of the Dams Raid. But I bet that most people would struggle to remember many of the other projects, besides the so-called bouncing bomb, which he worked on throughout his long career as an engineer. Back in the 1920s, Wallis headed the design team which built the R100 airship. This was a privately designed and built rigid British airship made as part of the Imperial Airship Scheme, a competition to develop a commercial airship service for use on in the British Empire. Two airships were to be built and trialled against each other, the best elements from both being used to develop a second generation of airships. The ships were to have a speed of 70 knots and carry 100 passengers over a range of 3,000 miles. One ship was built by the Royal Airship Works at Cardington under direct Government control, and the other was built by Vickers (under their subsidiary the Airship Guarantee Company) on a wholly commercial basis, with Wallis as Chief Designer. Although built to the same specification, and hence broadly similar with a length of over 700ft and a capacity of 5,000,000 cubic feet, Wallis’s R100 and the Government R.101 were very different in the detail of their construction. R100 was built from Duralumin (a light aluminium alloy) while most of R101’s structure was stainless steel. R101’s gasbags were held in place by a novel parachute-type harness, while Wallis developed a geodetic wire mesh for R100 to give greater gasbag volume. … most of R100’s structure was built from just 11 components (which could thus be mass-produced in their millions) and the entire structure was built from just 41 different components. Duralumin tubes of the length Wallis required were not available, so he designed a machine which would take flat Duralumin strip (which was available in long lengths), form it into a helix, and rivet the edges together to form a tube. R100 first flew in December 1929. It made a series of trial flights and a successful return crossing of the Atlantic in July–August 1930, but following the crash of R101 in October 1930 the Imperial Airship Scheme was terminated and it was broken up for scrap. R100, which it could be argued had the more innovative design, was thus terminated even though it had a more successful life. The brochure (from the Ray Hepner collection) whose cover is shown above would seem to have been designed about the time of R100’s first flight. The internal pages have an interesting design, which involved some hand mortising of metal type. The typeface is a large size of Garamond, with the full point hand cut so that it fits exactly above the tail of the curve of the swash capital R.
Wallis went on to use a similar geodetic wire mesh design for his later Wellington bomber, which made its maiden flight in 1936. More than 11,400 Wellingtons were built over the next decade, making it the largest production run of any British bomber in the Second World War. 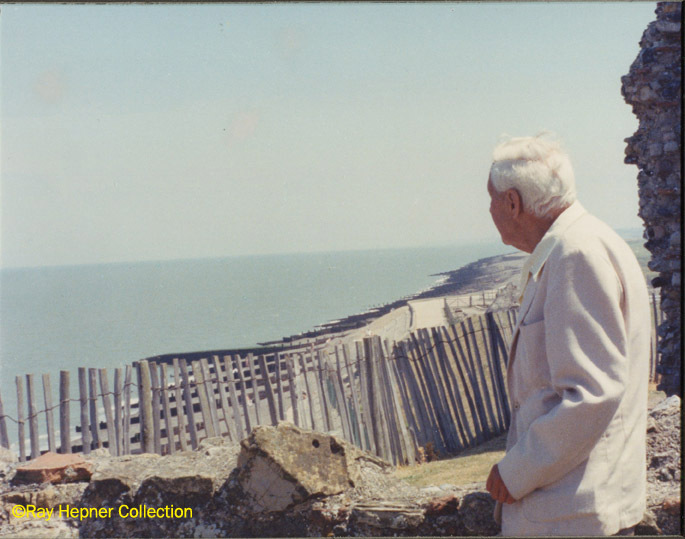 Ray Hepner has also sent me some more pictures of Barnes Wallis taken at Reculver in Kent in 1976, 43 years after Wallis’s previous visit, to observe the last test drops of his Upkeep mine, the weapon used on the Dams Raid. Here are Lady Wallis and Sir Barnes, alongside Ray, who is sporting a particularly fine pair of 1970s flares. All pics © Ray Hepner Collection. 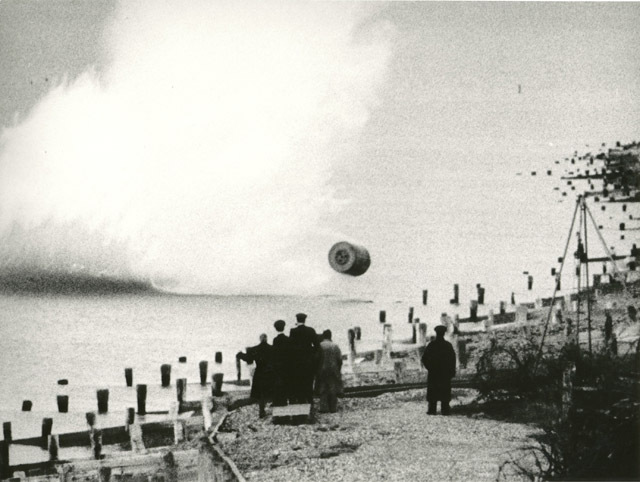 Barnes Wallis had never been back to Reculver in Kent, the place where the final test drops of his “bouncing bomb” took place in May 1943, until he was taken there by Ray Hepner in 1976. Above, in this previously unpublished photograph taken by Ray and kindly given to me by him, he surveys the scene. Below is a still from the film sequcnce shot of the tests, now in the Imperial War Museum. Wallis is the bareheaded figure on the far left of the group. In the film, he is seen to be waving his arms as if to urge the bomb onwards. Update: Mark Welch kindly pointed out the error in the title of my original post, “Barnes Wallis at Reculver, 43 years on”. My maths was badly wrong! It now looks as though there will be a number of events in May to commemorate the 70th anniversary of the Dams Raid. I am collating a list at the moment, but in the meantime I will be happy to advertise things as and when they are notified to me. Here is some news from Herne Bay in Kent, the nearest town to Reculver, which was the site of several test drops of the “bouncing bomb” by the RAF in 1943. 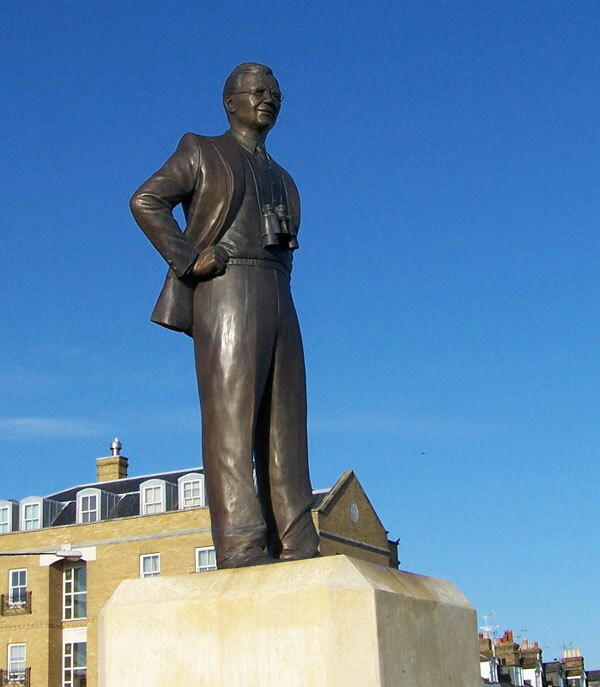 These took place under the active supervision of Barnes Wallis, and he is now remembered by a statue on the seafront, shown above. There will be a “full town” commemoration on Sunday 19 May. The organisers are hoping that the BBMF Lancaster will be able to participate, as it did in a similar event ten years ago, but this is not yet confirmed.